In the end, the task of gaining over a minute on Nairo Quintana on a mountain stage proved as impossible as might realistically have been expected. If the Colombian has a weakness, it is not uphill. The final 5km of the stage were mostly just Chris Froome attacking and Quintana following him with a face as blank as always. Quintana’s heard of facial expressions, but clearly at some point concluded ‘why risk it?’ It’s odd that Team Sky should be accused of being robots, given his unchanging demeanour. At least Froome has the decency to look like a distressed grasshopper when he’s climbing. As the finish approach, Quintana nipped past Froome and gained a couple more seconds. Froome applauded him as he crossed the line. 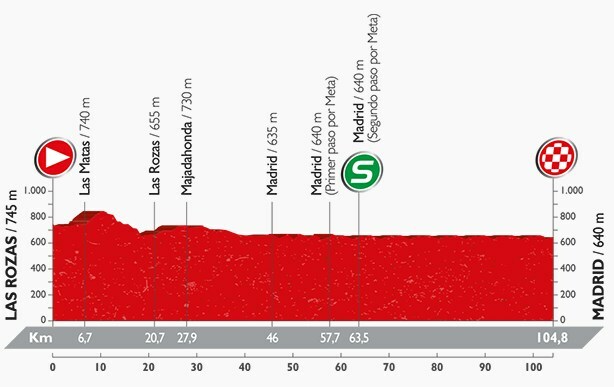 Barring some sort of crash on the largely ceremonial final stage, the Colombian will win this year’s Vuelta a Espana. Oddly, the long range attack came not from Alberto Contador but from the man fighting him for third place, Esteban Chaves. His Orica-BikeExchange team started hammering along halfway through the stage and Chaves then detached himself from the favourites on the penultimate climb. Contador was without team-mates by this point, while Chaves found his way to his colleague Damien Howson, who’d been in the break. With Quintana and Froome entirely unfussed by Chaves, the gap grew. Chaves eventually finished 46 seconds ahead of Quintana and 1m25s ahead of Contador, which has earned him third place at the Spaniard’s expense – a pretty tidy follow-up to second in the Giro d’Italia earlier in the year. Almost inevitably, the stage winner was a young rider from the break about whom little is known. Before today, Pierre Latour was best known for being called Pierre-Roger Latour, even though that’s not actually his name. Someone copied it incorrectly once and now plenty of people know him as that, including his team. It’s not really worth inserting the stage profile below, but I can’t really change policy at this late stage, can I? Today’s stage term is unusually specific – ‘Tertiary Basin of Madrid’. It’s one of several large depressions that formed between the mountain chains and mountain ranges of the Iberian Peninsula. All these basins are apparently filled with sediments formed during the Tertiary Period, in the last 50 million years. In sediment terms, I think that passes for ‘brand new’.